Web. Social. Mobile. How do you dominate those fields with SEO in an age of smart search engines? First of all, know your SEO history, or be doomed to repeat its failures. Second, make sure you do good SEO and avoid bad SEO. Here’s how. 1) White Hat SEO only. 2) Be intelligent, if you want to rank at the top of SERPs. 3) Produce the highest quality wherever and whenever possible. 4) Distribute organically on traditional websites, blogs, forums, and social networks, where you have verified or verifiable accounts and profiles. 5) Let the audience come to you. 7) Use the rel=nofollow tag on most commercial links. 8) Use images, infographics and video more, with proper tags and microdataformat information. 9) Use microdataformats to include good information about non-text media objects like images, audio, video and PDF files, that Google and other engines can easily read and index accordingly. 10) Optimize your site for speed and different platforms (Desktop, laptop, mobile, etc). 11) Use Google Analytics, Google Webmaster Tools and know them inside out as far as SEO is concerned. 12) Remove the worst bad old links you have, and Disavow those you can not otherwise take down. 13) Test, test, test … Apply best possible incremental changes. Rinse and repeat. Remember that just as in any other form of good marketing, you should focus on giving, selling, renting, leasing or otherwise making attainable to the people what they actually want. The higher your quality of work, the stronger your relationship will be with the user. If you make great content, as I hope I do, then your first goal with a user should be that your work is so great that the user will do everything just to sign-up to the freebie email newsletter on your site. Keep in mind that unless you’re publishing secrets for being successful in a particular field (as this site does often), you can almost count on your users to spread the word for you. And that kind of prosteletizing is the best kind of word of mouth marketing, or WOMM, you can hope for. This is because WOMM is real. It’s not paid for, and people, being social creatures, are more likely to click on a link from a trusted friend, then from a random marketer who somehow slipped into their stream of data. Some people who have warnings or even penalties in their GWT, have reported that completely ignoring these warnings and just continuing to produce better content has resulted in the penalties going away. However, for most webmasters, this is simply not the case. Just by opening the message, they are in a way acknowledging that they know that Google thinks they have done something that is a no-no in Google’s SEO rulebook. So definitely open your messages from GWT and fix whatever problem Google has been kind enough to share with you. It may take a while to do, and it may be a month or more until Google decides to lessen or remove your penalty. Whatever it takes, it’s worth it in the long run. Of course there are also commercial services like MajesticSEO, ScreamingFrog, SEMRush, LinkResearchTool, SEOMoz, SEOBook, QuickSprout, and tons of other SEO tools which can be of great help in finding and removing bad links. LRT is especially proud of their service in this area, marketing their “bad link juice” or toxic link removal feature as a selling-point for their paid service. Know Who Is Your Competition. To date, reports from webmasters are that while LRT is comprehensive, it may also be a little too sensitive about what is and what is not a toxic link. My own experience with LRT is that roughly 20% – 40% of the links which it recommended to remove, were in fact perfectly fine, and that no removal was necessary. At the same time, about 60% – 80% of the links it recommended that I remove for one particular client, which had more than 435,000 backlinks from around the web, did need to be fixed, removed, and in a few cases, disavowed. 1) Do Grey Hat or Black Hat SEO. 2) Produce a ton of web spam. In fact, don’t publish any webspam at all. 3) Create a ton of thin profiles and accounts to blast cheap-o links and barely legible comments on news sites, .edu sites, .gov sites, online fora, social media and other web sites. 5) Buy followers, friends, likes, shares or re-pins. 6) Try to outproduce the largest brands in your field. 7) Googlebomb irrelevant garbage with poor quality links and anchor text. 8) Make most of your links “follow” links. 10) Use non-readable technologies like Flash and iframes for displaying content on pages that you want to rank high. 11) Think you know everything and that you have nothing left to learn about improving your SEO. 12) Feign ignorance about the latest SEO tweaks, hoping Google will let you slide. 13) Ignore Yahoo!, Bing, Yandex, DuckDuckGo and other big search engines. For better or for worse, Google actually believes that its bot is now smart enough to make most decisions about what is high quality content and what is webspam. Even if you know you’re doing everything by the book, you should probably incorporate a few things that de-optimize your SEO strategy a little. Otherwise, it will reek of manipulation, and that’s a no-no in today’s SEO reality. Keep in mind that the days of owning the search results by tricks and shady ruses are long behind us. Yes, you can still get short term gains from those methods, but they will eventually come back to bite you in the backside. And if you make a bad mistake, you could even harm or kill a real, valuable brand. Just look at what happened to JC Penney. Someone there doing shady SEO tricks tried to fool Google with paid backlinks in 2012 and got spanked hard by Google. It took them a long time (relatively) and a lot of headaches (and probably lots of money) to get back into google’s good graces. Remember that those brands and marketers who have legitimate massive appeal will organically crush most of their small-time competition without even trying. Unless you’re selling cold-fusion in a cup for under a buck, or something as cool, useful and catchy as WhatsApp or SnapChat, there is just no way you’re going to have millions of users and genuine backlinks overnight, or even within years. That kind of popularity is usually grown slowly … repeat … s–l—o—-w——–l–y. Staying on top of the lesser search engines is also key to SEO success, because, even though individually they may not add up to much, overall, they account for at least 25% of all searches, and even more if you also include social media search engines. This means that you should be sure to do some non-google optimization, lest you ignore those audiences, and lest you make googlebot think you are only targeting google for exploitative purposes. And always remember that very often, the best SEO looks very much like organized chaos. Organized on the back end, and often chaotic-looking on the front end, with no single routine or format to encapsulate all of the work that goes into it. All the same, you should be more concerned with being organized. The organic nature and the benefits of what appear to be chaos will ensue, just by the very work that is done by you, and the audience with whom you have cultivated a relationship. Done right, they will eagerly look for ways to link to your site from at least one of their own sites or social profiles, if not more. My independent social agreement with you: If you like what you saw on this page and want to help me in my quest to challenge Google’s public pronouncements on publishing great content, then please share the link to this page on your social network profiles and anywhere that you think it might help other people. Previous Lesson: Web Marketing Lesson 2.6: SEO Overview : A brief history of search engine optimization. Next Lesson: Web Marketing Lesson 4: Building A Site After Domain Name Registration. The best, easiest, fastest way to build your website, pre-optimized for search platforms and different devices, right from the start. There’s something nifty in a popular Google product, even if you don’t know it’s there. Despite my not-always-positive views of the Google, overall I do think they are a remarkable company. One of the great value assets is their ability to create really useful software applications. Gmail, the popular google version of email on the web, aka: webmail, is one such application. 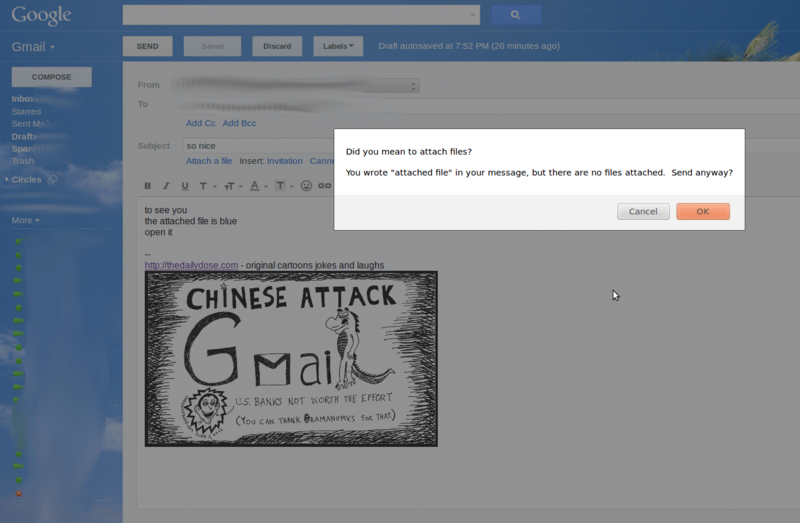 In Gmail, when you write an email, and mention an attachment to your recipient, the webmail application checks the message to see if there is in fact a file attached. That way, you don’t accidentally send without the file you intended to attach. You’ll see a screen similar to this (minus my in-signature cartoon) when you forget to attach a file in your gmail message. Did you mean to attach files? You wrote “attached file” in your message, but there are no files attached. Send anyway? And then it offers you to “Cancel” – go back to the message to attach the file you want to include, or “Send Anyway” – without an attachment. Now, it is a little silly to call the “go back to the message” button “Cancel”. Why not just label the button “Go back to message to add attachment(s)” ? or just “Attach” and make it go straight to the file attachment facility? I don’t know. I guess they have a reason for it, like, the software engineers don’t know how to communicate plain English so fluently now that Marissa Mayer has moved over to Yahoo! All the same, it is a brilliant and handy little feature, ensuring a higher quality experience when sending email from your Gmail account. So there you have it. If you already use Gmail, I hope that you enjoy this useful built-in feature. And I publicly applaud Google for this great tiny evolution of webmail. I hope other email and webmail makers include a similar feature in their own applications, sooner rather than later.